The Halászcsárda at Roosevelt Square has been open to its guests for several decades in the heart of the city next to the old bridge. The guests can choose from a great variety of fish dishes, game dishes and other specialties. 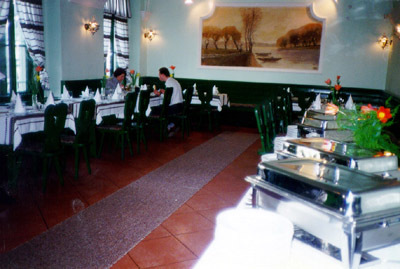 The restaurant consists of a main room, two banquet-halls and a shady terrace in front of the restaurant. The "hostess of the restaurant" serves the guests free drinks before the meal. We recommend you to try one of the great specialties of the restaurant: the “Fish soup with bags from the Boszorkánysziget”. It is a Szeged-style fish soup of carp and other quality fish relished by onion and paprika; its specialty is the spiced fish pluck cooked in little bags made of paste. You can eat a buffet lunch or dinner every day. We can set up menus for family or group events according to your desire. Our banquet-halls are ideal for reunions and banquets. Our unique Tiszaparti Fish Party is made up of fish soup cooked on open air fire, Szeged style goulash and other barbecued delicacies. For gourmets we serve a meal of 24 different dishes, only the peacock feather is missing. Our restaurant is ideal for lunch or dinner after meetings and conferences as it is easily approachable even on foot, and is surrounded by Szeged’s most famous sights. For tourists arriving in Szeged by bus getting to the restaurant is very easy, as it is close to the bus parking lot on the river bank. A band of three talented gypsy musicians are responsible for creating the real “csárda” atmosphere at dinner-time.